A handy portable light that's been designed with camping in mind, the Eco Orb Tent Light is a battery operated bulb that shines for up to four continuous hours on one set of batteries. 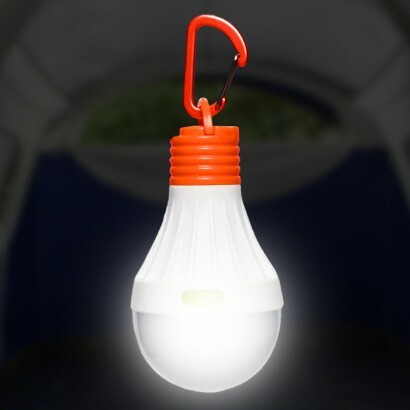 Complete with a carabiner clip that allows you to hook the light onto any convenient loop, the glow in the dark switch makes it easy to find in darkness and with four functions you can choose the intensity of light that fills your tent. Perfect for adventures outdoors, this handy clip on light gives you a guaranteed, reliable light source and it can even be clipped onto your back pack too!